Well friends, the NHL is back in action for another season of the good (Jaromir had a team!) the bad (the Penguins upcoming White House visit) and everything in between. Since the season is only days-old at this point, there’s not much in the way of winners and losers, but what we can look at are my thoughts on the season ahead. Who is destined for greatness? Who will probably not make the playoffs? Read ahead for my thoughts. 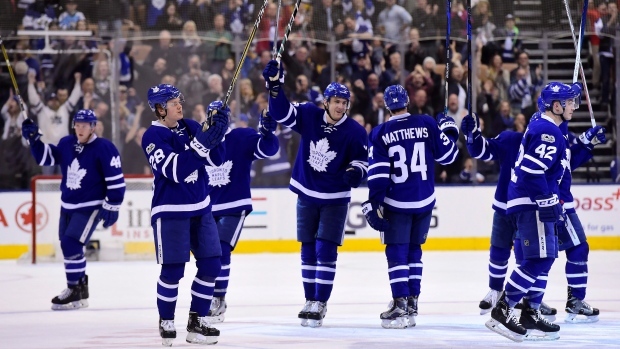 Toronto Maple Leafs – As much as it pains my heart to say this, the Leafs are probably going to have a good season. The young talent they acquired last season will likely only continue to get better as they get more ice time under their feet. Also, the acquisition of Patrick Marleau will offset the crop of youngins’ to bring some veteran leadership into the mix. I would be very surprised if the Leafs do not make the playoffs this season. Edmonton Oilers – Similar to the Leafs, the Oilers have had a few years of rebuilding that are finally coming together. In the offseason they locked up Connor McDavid and Leon Draisaitl on long term contracts, their defence is strong and the goalie situation is solid. They could probably use a higher calibre backup goalie, but if the defence does their job well, they should be in good shape for the season. Columbus Blue Jackets – While it is doubtful they’ll go on a run as spectacular as their 16 game winning streak in the 2016/17 season, expect the Blue Jackets to have a solid season. They are a team that often flies under the radar, as they don’t get the press coverage of the “Original Six” or many of the Canadian teams. But, this actually plays to their advantage because they don’t face the higher expectations of these other teams and can therefore surprise. Plus, I’m sure none of the players want to get on John Tortorella’s bad side. Dallas Stars – I’m taking a bit of a chance with this choice. For the last few years, the Stars have had all the right pieces to make a winning team, but they’ve not been able to put it together. With stars like Jamie Benn and Tyler Seguin, they have the shooting power to score goals, and this year they have only strengthened their team with the somewhat surprise acquisition of Alexander Radulov from the Montreal Canadians. Added to this they have some up and coming defensive talent in Jamie Oleksiak, they recently acquired Marc Methot from the Ottawa Senators and they finally have a star goalie in Ben Bishop. All the players are there, it’s just a matter of if they can put it all together. Montreal Canadiens – What is there to say about the Canadiens other than the fact that it’s a good thing they still have Price, because they don’t have a lot of anyone else. In the off season, the lost both Radulov and Markov and didn’t acquire anyone to fill these gaps. Don’t get me wrong, Max Pacioretty, Alex Galchenyuk and Shea Weber are all very capable players, but is that enough? This year, I don’t believe so. Arizona Coyotes – Oh the Coyotes. In the offseason they did not re-sign their longtime captain, Shane Doan, nor did they do much of anything else. The team does have some bright spots in talent with Dylan Strome and Max Domi, but that just won’t be enough to carry them through the season. Vancouver Canucks – The Canucks are suffering (like many teams) of a case of aging players with little talent to replace those who are getting closer to retirement. The Sedin twins are not going to last forever, only a few more years at best. Their defensive squad is no one to write home about, and basing their goaltending on Markstrom and Nilsson is questionable at best. Will the Canucks make the playoffs this year? As of right now, I wouldn’t bet on it. But maybe I’ll eat these words come April. Nashville Predators – The Predators are a good team, but are they 2017 playoffs good? I have doubts. They’ll probably do decently well over the season – they made no huge changes in the offseason, other than the retirement of captain Mike Fisher. But, I cannot see another near-Stanley Cup run happening. This season I’d also watch for backup goalie Juuse Saros to start more games and for Pekka Rinne to start less. Boston Bruins – This pains me to write, but I do not expect Boston to have neither a good nor terrible season. They’ll probably fall near or just out of 8th place in the playoffs and not much better or worse. Boston needs new blood and they need it badly. The core of Bergeron, Krejci, Marchand and (my beloved) Chara are no doubt aging and need some up and comers behind them to pick up the slack. There are some bright spots with young defensemen Brandon Carlo and Charlie McAvoy, but I don’t expect that’s enough to create a star-studded, playoff running year. Ps. I’m going to see them play AT HOME later this season, so expect a tear-filled post about that come Mid-November. Washington Capitals – The motto of the Capitals should be “if not now, then when?” The Capitals just cannot ever seem to put it together in the offseason. They have a stellar pre-season run only to be abruptly eliminated, frequently by the Pittsburgh Penguins. The best hope for the Capitals is for Pittsburgh to have a below average year, so that they get put out before facing the Capitals in the playoffs. Will they have a good year this year? Quite likely. Will it be good enough? Quite unlikely. Calgary Flames – Firstly, I give a huge virtual high five to the Flames for singing Jaromir Jagr, who desperately wanted to play one more season in the NHL. Though he recently announced (very sadly) that this will likely be his last year, I would like the team to do well to give him one last cup push, but really cannot see that happening. Calgary just suffers from a ‘classic case of the mehs’ they’re good, but not great. They have a lot of flaws, but they do have Jagr now, so maybe just thinking of his majestic flowing locks will give them the motivation they need to win games? We can only hope. Vegas Golden Knights – The Golden Knights are starting their very first season, ever. So, what will that bring? Who knows. Most of their players have limited NHL experience, so there’s going to be quite a learning curve once they get on the ice. However, they have a (multiple) Stanley Cup winning goalie in Marc-Andre Fleury. There is only so much Fleury will be able to do without ample backup, but still, he’s going to be a tough opponent. How will they fare this season? I’m going to guess a just out of the playoffs finish, in approximate 9-12 place in the Western Conference. Stay tuned as the season progresses for bi-weekly roundups!